At 86, Noam Chomsky is getting old. He remains indefatigable, keeping up a schedule that would exhaust a man half his age, but, unless he is indeed a demi-god, we can assume that the end is nigh. The tragic day cannot be more than a few years away, if that. This has set me to thinking: why, after all, does it strike me that his death will mark a day of global mourning, at least among the sane and the subaltern? What is it about him that entrances so? There are plenty of activists around the world more heroic than he, more selfless, many people who have devoted their lives more single-mindedly than he to rescuing humanity from its sinking ship, and who have, perhaps, done more concrete work to end suffering. These countless unknown people deserve at least as much reverence as Chomsky. There are, of course, many reasons why Chomsky is such a cynosure, some of them not very interesting. The most obvious is the quality of his mind. All things considered, he has probably the greatest mind of the twentieth century, and one of the greatest in human history. Einstein didn’t have anything approaching Chomsky’s breadth of knowledge (about virtually everything, it seems) or razor-sharp logical vision or remarkable memory. It’s hard to imagine that anyone has ever been a better debater than Chomsky, as one can judge from various YouTube videos. And of course he largely founded modern linguistics, and has made important contributions to philosophy, and so on. But I’ll let the eulogists celebrate his intellectual powers when the time comes. There are more interesting issues I’d like to consider here. Another source of his mystique is his charisma, by now a sort of shy, grandfatherly, warm and self-effacing persona, combined with an absolute self-certainty. But charisma, as such, should not impress us: it is a sub-rational phenomenon, a form of “dominance” similar to that recognized in other mammalian species, which in itself has little or nothing to do with morality or reason. The most charismatic people can be the most irrational and immoral. Even less interesting is the fact that since the 1960s he has been a nearly ubiquitous presence, more full of energy and stamina than any other intellectual. This is impressive and helps explain the adulation he receives, but it isn’t mainly what intrigues me about him, or what I find useful about him. His astonishing command of facts and extensive documentation of U.S. crimes are extremely useful, but they’re too obvious to deserve comment. His unusual kindness and solicitousness towards “ordinary people”–for instance, his spending many hours every day answering emails–is likewise admirable, and obvious. But in addition to all these considerations are things about him I find especially noteworthy, which may be worth mentioning here because of the lessons they hold for us. For I think that he, or his public persona, can serve as a sort of moral and intellectual compass, keeping us on the road less traveled–less traveled because it requires some effort and willful independence. It’s useful to have a guide on such a path, and there is no better guide than Chomsky. To speak plainly, he can serve as a symbol of certain intellectual and moral tendencies–much as Marx does, though in a slightly different way–tendencies that in fact amount to little more than simple humanity and common sense, but that are surprisingly easy to forget in our indoctrinated and power-hungry world. 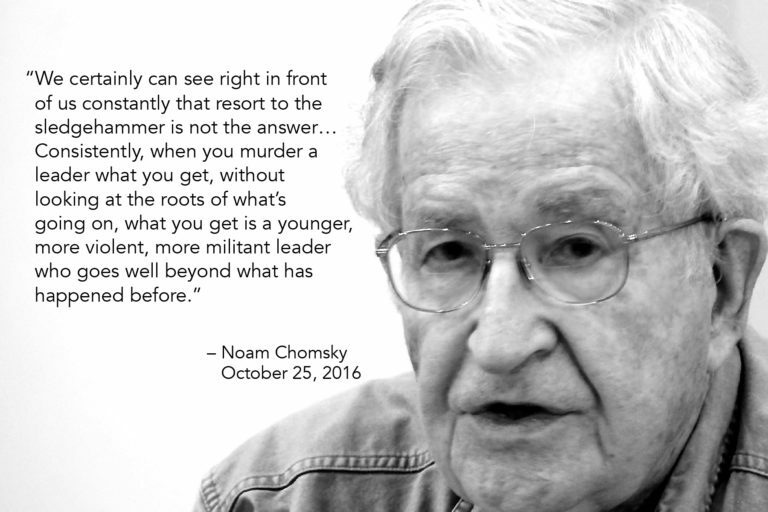 In short, we could do worse than to take Chomsky as our role model. This entry was posted on Wednesday, July 4th, 2018 at 00:05	and is filed under Uncategorized. You can follow any responses to this entry through the RSS 2.0 feed. Both comments and pings are currently closed.